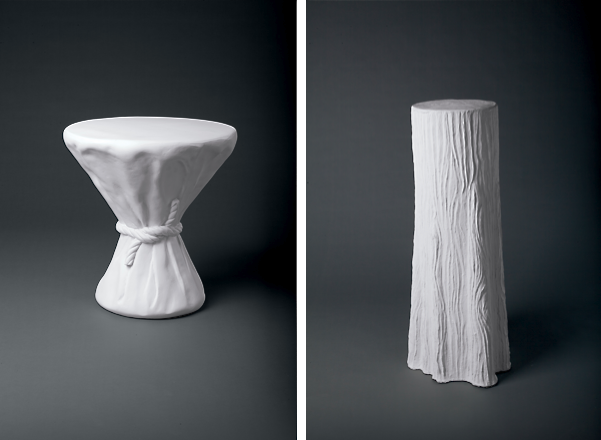 The table with rope tie and tree stump pedestal are shown. Making News . . . if you're an interior designer, architect, or someone who loves great design, you already know about John Dickinson's famous white plaster furniture, produced during the 70s and early 80s. 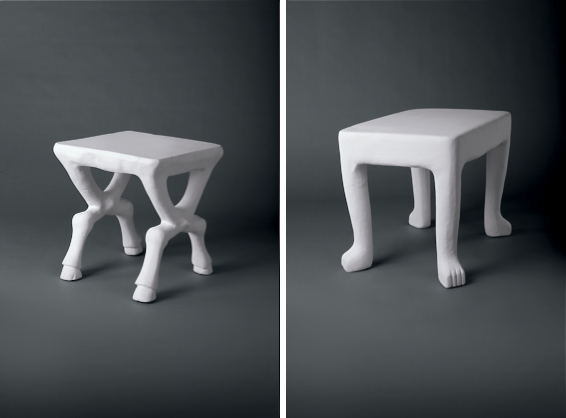 Often anthropomorphic with chunky animal or human-style legs, his work was influenced by African motifs and nature. What you probably didn't know is that Dickinson had a strong Dallas connection. 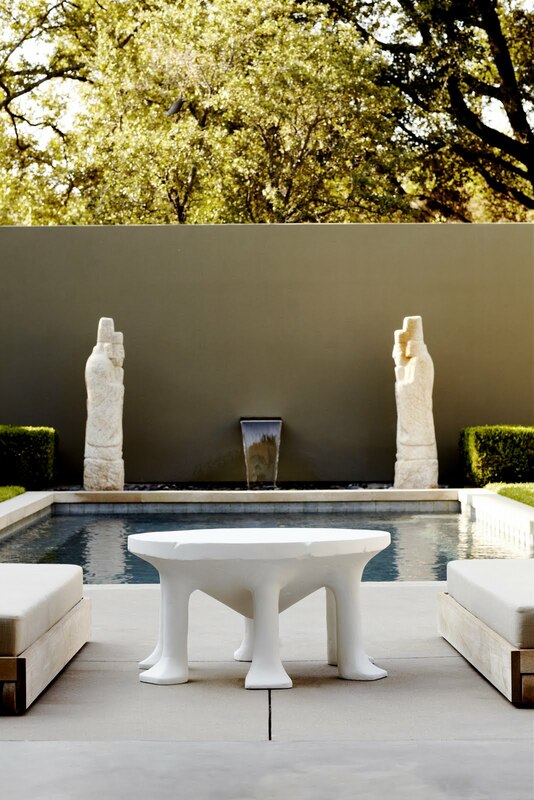 At the time of his death in 1982, he was collaborating with Dallas showroom owner David Sutherland to produce his furniture in fiberglass reinforced concrete. "Plaster is heavy and brittle. It literally falls in on itself. Nothing that John ever shipped wasn't damaged when it arrived," Sutherland tells me. "He and I were working together to make a material that wouldn't crack when he died." Dickinson's demise put everything on hold for the next three decades. But this month, Sutherland's collaboration with the great designer finally comes to fruition. The Sutherland John Dickinson Collection makes its debut with 13 key pieces of estate authorized productions. They're made in fiberglass reinforced concrete, from the creator's original molds and stamped with the Sutherland logo on the bottom. "This has been a nostalgia trip for me," says Sutherland. "I've been thinking about this for more than 25 years." From left, Dickinson's Hoofed Table and Footed Table. The original plaster furniture is scarce and goes for thousands of dollars, but it took decades before people appreciated Dickinson's designs. Angelo Donghia introduced Sutherland to Dickinson and his designs in 1980. 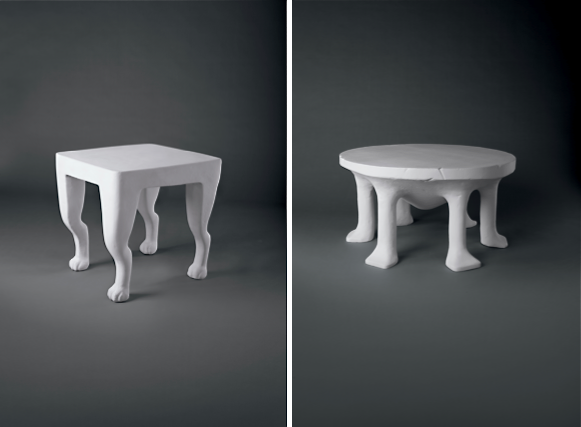 "People used to call it Fred Flintstone furniture," he says. "Most people didn't get it, but some of the most sophisticated designers in the southwest were buying it from me." 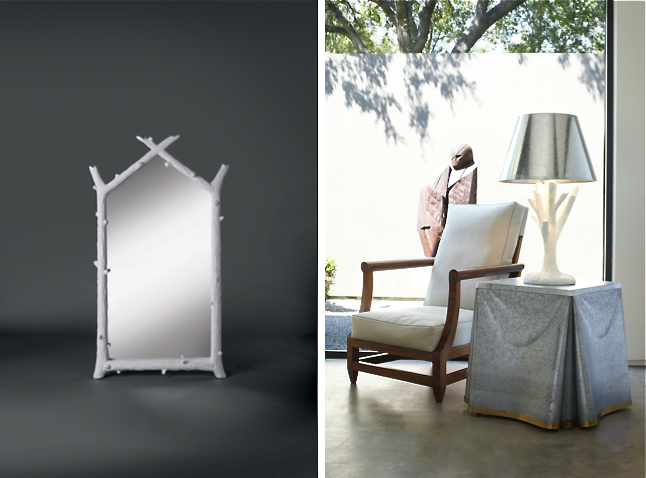 Dickinson's Twig Mirror, Twig Lamp and Tin Table. "When John died, everything came to a screetching halt," says Sutherland, who was left with a dozen or so samples of the reinforced concrete pieces the two had been working on. "I decided to put them in storage, and always had a piece or two in my homes." Several years later, the owner of the company who was making the replications went out of business, and offered the Dickinson inventory and molds to Sutherland. "At the time, the Dickinson estate didn't want them, so I brought them to Dallas and put them in storage." Dickinson's Large Lamp with Dome Shade and Footed Lamp. Dickinson was revered on the west coast -- the San Francisco Museum of Modern Art did a retrospective of his work shortly after his death. But Dickinson was mostly unknown anywhere else until 2000, when some of his pieces were put up for auction. "There was a frenzy to buy his work all of a sudden," says Sutherland, who kept in touch with the executor of Dickinson's estate. "The time never seemed right to reintroduce those pieces we'd been working on. I've lived with it all these years, and finally, it was time," he says. Because the pieces are made of reinforced concrete, they will last forever outdoors. But that wasn't the original intention. "I started working on the idea of reinforced concrete with John seven years before I started doing my outdoor collection," says Sutherland. "It's nice to have whimsy and a different look for outdoors, I think." 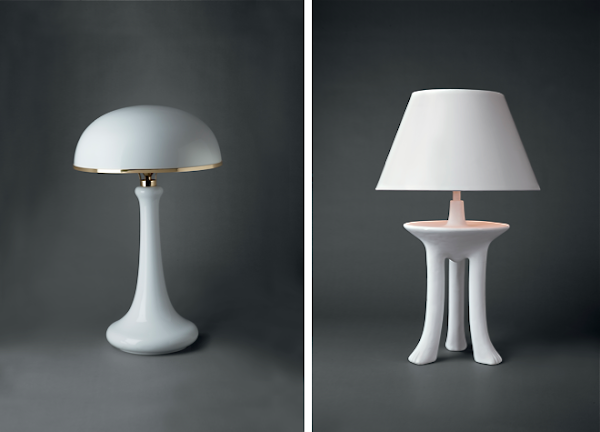 The 13-piece collection includes lamps, a mirror, side tables, coffee tables, a galvanized steel end table, and a rare six-legged African table that Dickinson had in his own home, but never made available for sale. Five or six more pieces will be introduced in the years to come, he says, including a bar console, floor lamp, wall console, and the possibility of pieces with different finishes. "John's favorite color was chalk white, but he loved the idea of people changing the look, doing whimsical things to them," he adds. "I'd like to have seen what John would have come up with had he lived longer, but I think he'd definitely be pleased with what we've done."